Marie Stone Larson was EWGS president from 1972-1973; her obituary was in The Spokesman Review today. If you'd like to read the obit and/or leave a message in the online guest book, Google and click to Thornhill Valley Chapel. She was 89 years young. 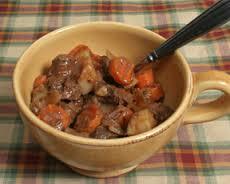 He wrote, "(I am) saluting everyone who came to Spokane from the other 49 states.... all ingredients in our big pot of Spokane stew." What nationality did your family bring to Spokane?? As you've driven through Colfax to points south, you've likely zoomed right past the Top Notch Cafe without even really noticing. Too bad. The Top Notch Cafe looks much like it did when the doors opened way back in 1938. Still a long, narrow cafe, with booths, bar and stools and the original wooden backboard. 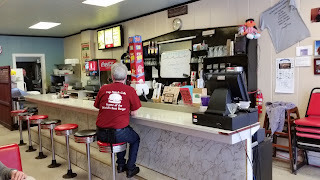 The waitresses' shirts tell the tale: Home of the World's Best Burger, and after lunch there last week I'd be hard pressed to disagree. As he flips the ten different kinds of burgers, the cook is singing! That's an unusual treat. According to www.HistoryLink.org (the website for Washington State History), Colfax was named for Schuyler Colfax, the VP to President U.S. Grant in the years 1869-1873. Whitman County was signed into being on January 29, 1871 and Colfax was born on January 14, 1879. 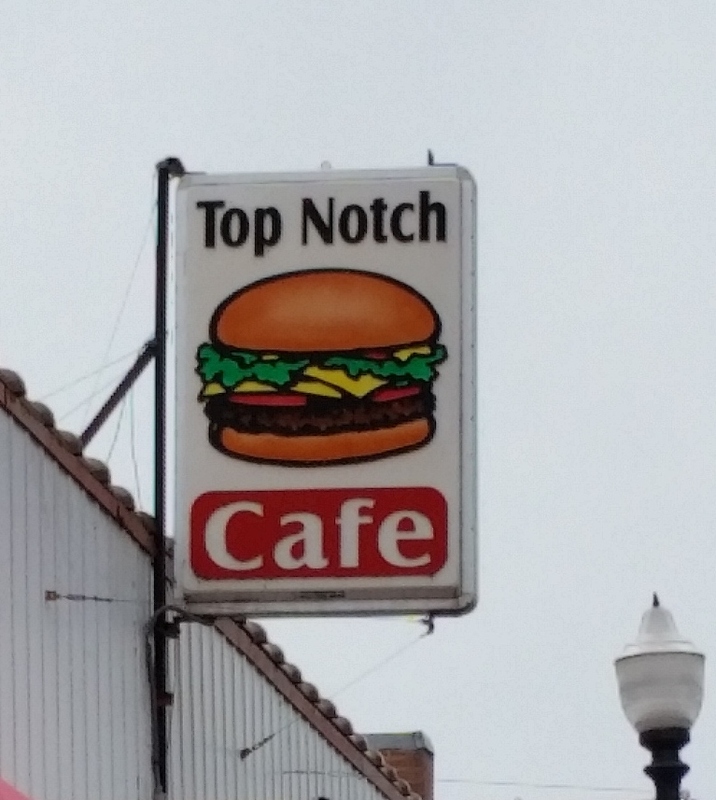 This is not an ad for the Top Notch Cafe, although it could be. My point here is that we zoom past history too often without giving it a second thought. Do stop the next trip north or south on U.S. 95. While we were in Hawaii in February, on the Big Island, we visited a heiau or ancient sacred temple site of the Hawaiian people. 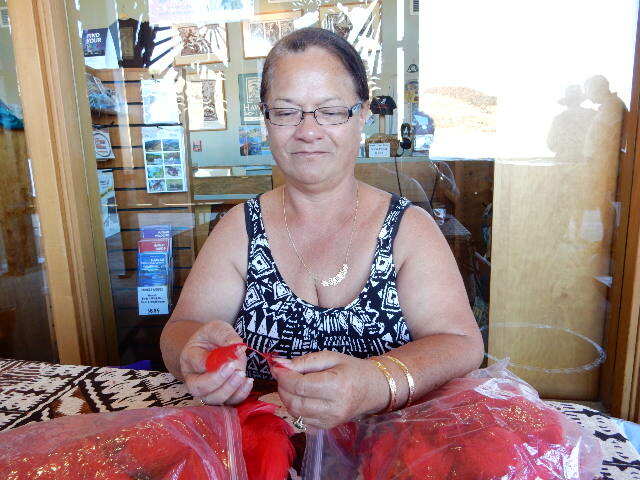 At the Visitor’s Center, I met Nani, who explained to me that she was an ali’I, or royalty, and was a direct descendant of King Kamehameha. Wow. I asked if I could take her picture. Upon returning to my own desk, I did some Googling. King Kamehameha died a bachelor in 1872. So that nixes that. But there are surviving collateral lines, according to the websites I searched. 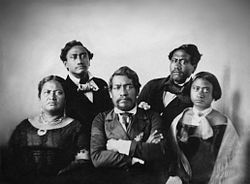 Here is a photo of the royal family: King Kamehameha III is in the center; his wife is to his left; Kamehameha IV is to the left rear; Kamehameha V is to the right rear; their sister is to the lower right. I was fascinated by all the Hawaiian street names. Most were Hawaiian but I spotted these: Pszyk, Peck, Oshiro, Volcano, and Pu’u O’o. I’d guess that 80% of street names were Hawaiian but these others reflect the mixture of cultures in these islands over the decades. We’ve been told by everybody who is anybody in the genealogy world, and many from other worlds, to have more than one good computer backup. Many, including Thomas MacEntee, recommend a 2TB portable hard drive (“buy the biggest one you can get!”). But what brand is the best? A good, reliable, online backup service is Backblaze (www.backblaze.com) and their website offers a quarterly “Hard Drive Reliability Review.” You might consider using Backblaze ($5 per month) and for sure reading their advice about buying a reliable portable hard drive. How many of you did photobook projects with MyCanvas, a subsidiary of Ancestry? I had done four projects with MyCanvas myself. So I was all eyes when reading a recent email from Ancestry: “As of 4 April 2016, you will no longer have access to your original MyCanvas projects stored on Ancestry.com. Good news, you can transfer your projects to the new MyCanvas now owned by Alexander’s and continue working.” Click to www.mycanvas.com and follow the links to transfer your projects. And better be doing it asap! Do you enjoy learning new words? I surely do. My latest word is irenic. If used as an adjective it means “aiming or aimed at peace.” If used as a noun it means “a part of Christian theology concerned with reconciling different denominations and sects.” How would you use this word in a sentence?